I am a French astrophotography enthusiast who follows your great forum for 1 year, a lot of response here compared to what can be found in France, so thank you for all this help! Here I worked with a DSLR (T3i), a 250/1000 and Azeq6 for 4 years and I encounter a lot of problem for 1 year on my treatment. I do not think I've changed my way of working so I'm starting to have a lot of help. I've tried all kinds of Rejection% and windsorized Local Normalization or ABE before the stack but nothing helps, I end up with a horrible picture. Each time it is a huge fight to remove this gradient, while I thought that integrating 40h we should just have less problem. here I need help! and I would surely have other questions about DBE that I use to solve this kind of problem but who do me things also bisard but everything in his time for now I would like to understand what goes wrong! if you need special information tell me I will respond quickly. Thanks again to all! 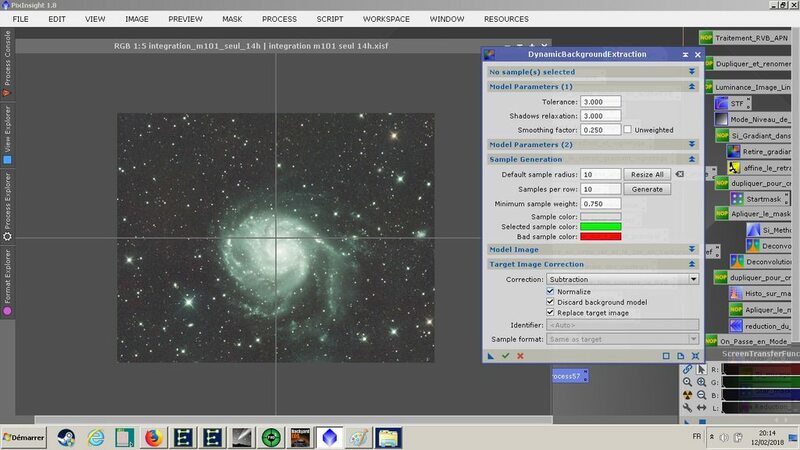 and thanks Pixinsight which is really great software for astronomy! 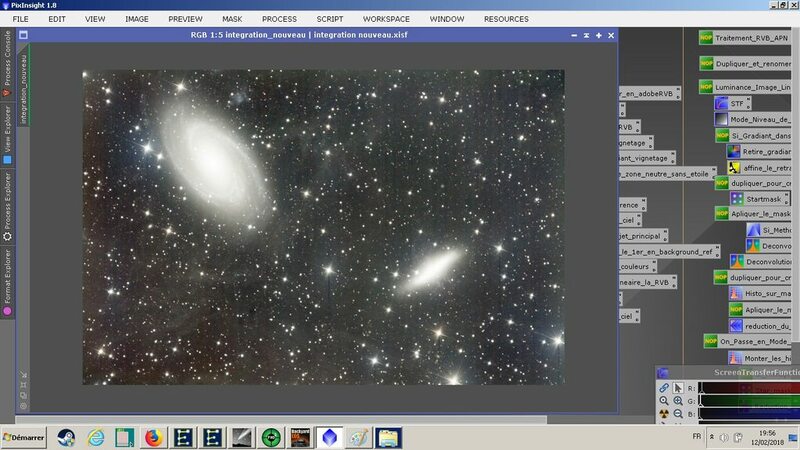 with respect to the M81/M82 picture, you know about the Integrated Flux Nebula, right? 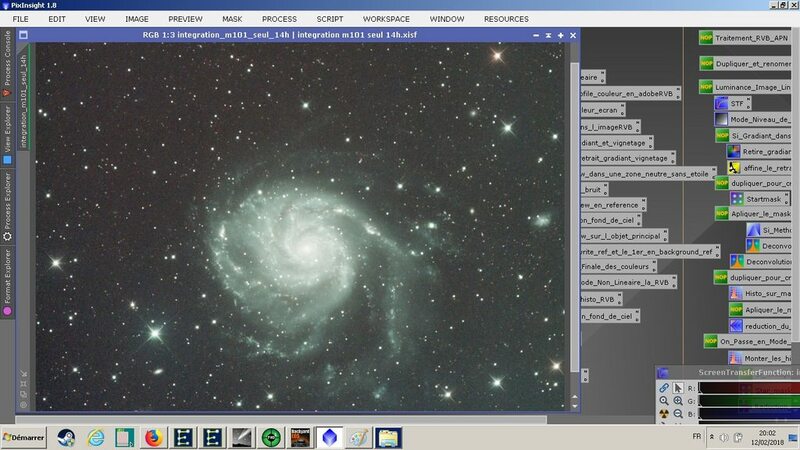 the M101 image seems fine, it just needs to be color balanced. 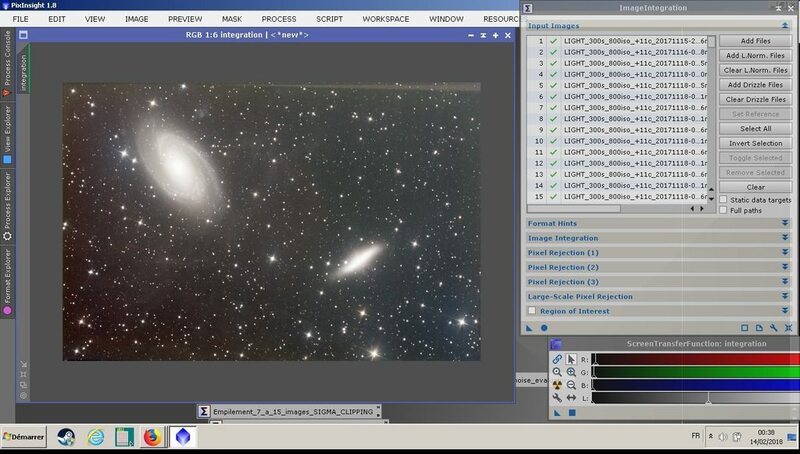 or are you talking about the vertical streaks in the M81/M82 image? yes I know there is IFN lol still happy with 40 Hours! the problem is the very present chromatic noise, you see, different colors all over the place? yes, now i see what you are talking about, the thumbnails are too small to really see it well. the CanonBandingReduction script (with highlight protection turned on) can help with the banding (but you have to rotate the image 90 degrees.) however the background is definitely weird, and i see the streaks. i think those are probably caused by hot pixels not being corrected during calibration. you can try turning off Dark Optimization to see if it fixes that, or else run your subs thru CosmeticCorrection to try to eliminate any hot/warm pixels left in the calibrated frames. I will try without optimization but I do not think it comes from that. For cosmetic correction I am of course used on all calibrated images. I'm not trying to give how to solve the problem but more of a case of showing the problem on a larger scale. Your background noise looks like an alignment problem. I wanted to see the noise without as many distractions from the rest of the image. Here is what I found. On the left side of the image the noise sweeps towards the upper left. In the center it is straight across the image and on the right side it sweeps towards the upper right. If you have an alignment problem I would think there would be no difference if you had 1 hour or 40 hours of integration, the problem would still be there. just guessing here, but if there is a lot of pattern noise left in the calibrated subs, and they were registered with distortion correction, maybe that's where the noise "directions" come from. anyway if you already did CC and there's no hot/warm pixels left over in the subs, then perhaps my theory is wrong. but it looks typical to me for DSLR images - for whatever reason there always seems to be some kind of pattern noise left over in DSLR images. the banding is an example of this - in areas of low signal, the image has been corrupted by the camera electronics. yeah the DSLR walking noise is something I deal with from time to time because I don't guide and shoot from a Bortle 7-8 location in high humidity. The LP here is a ..... Generally with mine the noise is in one direction not this semi-circular pattern. When I was playing with the image and looking at the different scales there is electronic pattern noise also but it is way down and didn't seem like an issue but I guess it could be. Now that you tell me, it is true that I have a problem of rotation of field quite recurrent, my setting in station is very good and I guide to the optical divider, however I think to have a big error of cone on the tube. .. In addition, I have no problem on M33 and M31 and other objects in this region. Yet an alignment with distortion correction should not solve the problem? In any case I had never thought of that, it's a point that I will have to look carefully. How do you advise me to align my brutes? Thank you all in any case for your time! i think StarAlignment can take care of the rotation with no problems, but what's happening is that the noise is getting distorted by the distortion correction, and then when it is stacked you get these funny moire patterns in the noise. but is distortion correction really turned on? perhaps try running SA with distortion correction turned off? by 'brutes' you mean "raw frames" right? I am talking about light calibrated sorry. It's an interesting track so I'll try several tonight and I'll let you know! There is a little less light because I did not want to reprocess the 489 lights but the problem is still present after an alignment without correction of distortion.